Former Florida governor Jeb Bush is one step closer to throwing his hat into the 2016 presidential race after resigning from all of his corporate and nonprofit board memberships on New Year’s Eve. In an email sent from a Bush aide to the Washington Post on Wednesday, the former governor is said to have resigned from his own education foundation, as well a lucrative for-profit education firm that sells online courses to public university students in exchange for a share of their tuition payments. On Monday, Bush also said he was resigning from the board of real estate investment trust Rayonier Inc. That move followed an announcement last week, in which the former governor said he would resign from the board of Tenet Healthcare Corporation by December 31. He further said he would be stepping down from his advisory role at the UK banking and finance multinational Barclays. The statement added that Bush is considering his options regarding businesses in which he still serves as an owner or partner, including consulting firm Jeb Bush & Associates and Britton Hill Holdings, a Florida-based private equity and business advisory group. Spokesman Kristy Campbell called Bush's review of his business interests "a natural next step as he turns his focus to gauging whether there is support for a potential candidacy," AP reports. Bush, the son of former president George HW Bush and the brother of former president George W Bush, served as Florida’s governor between 1999 and 2007. 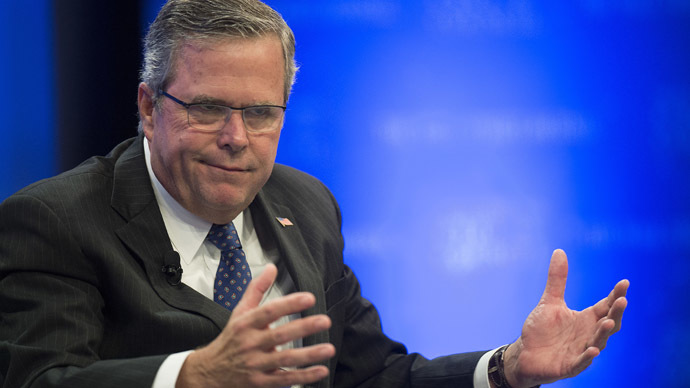 The 61-year-old is currently viewed as an early favorite to win the Republican primary in 2016. On December 16, Jeb Bush released a statement on social saying he was “actively” exploring the possibility of running for President of the United States.